Stormwater runoff pollution is one of the greatest threats to our region’s waterways. 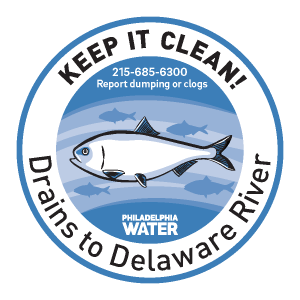 The Partnership for the Delaware Estuary can provide small groups and municipalities with supplies to combat “stormwater runoff pollution.” These include: instruction manuals, safety vests, adhesive, “No Dumping” storm-drain medallions, and educational tip cards. We can also provide tips and tricks that will make it easy for you to coordinate employees and volunteers as they hit the streets, marking storm drains and spreading the word about water pollution. Stormwater runoff pollution is one of the greatest threats to our region’s waterways. This occurs when rain or melted snow flows over watertight surfaces, such as driveways, sidewalks, and streets. Rather than naturally soaking into the earth, this runoff picks up litter, chemicals, and other pollutants on its way into storm drains. It is then discharged on occasion into the waterways we use for swimming, fishing, drinking water and more. Are you looking for a way to make a difference in the environment this spring? Sign up for the Philadelphia Storm Drain Marking Project! This is a fun and easy way to give back to the environment this year. By signing up you commit to marking at least 15 storm drains with your team in the city. You simply glue medallions on the curb above the storm drains to remind people where the water drains! Many people have no idea that storm drains flow to local waterways, so they use them as trash and toxic waste dumps. Since Philly gets all of its drinking water from local rivers and creeks, this message is extremely important to everyone in your neighborhood and the city. All supplies are FREE, and it’s easy to volunteer. First, decide how many medallions you want to glue – each kit does 15 storm drains – and then complete the online registration form. Only one person per team needs to register and you can register for multiple kits at one time. We will use this information to contact you about supplies. Supplies are limited: first come, first served. Pick up dates will be determined later. After you have your supplies we ask that you mark only your assigned drains. After completing your project, please return your final report, which is included with your supplies. The Partnership for the Delaware Estuary is happy to use its bulk-purchasing power to help municipalities save money while, at the same time, satisfying their MS4 requirements. Please click here to see if this program fits within your budget (PDF file).